We have the experience to work closely with your packaging, engineering, marketing, quality, and procurement teams to ensure the smooth integration and implementation of the IC magnifier technology into your product packaging and labeling systems. We understand the importance of minimizing the impact that any packaging changes may have on established manufacturing processes. 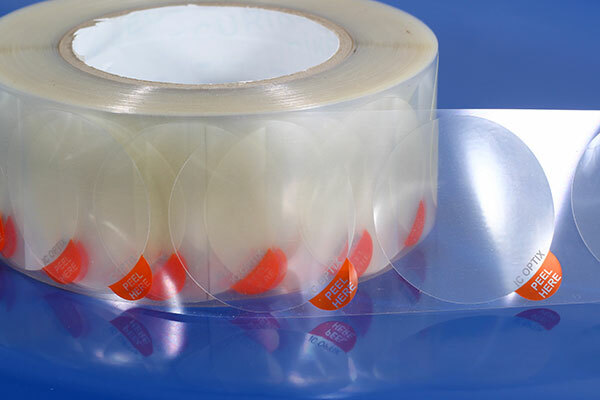 The design of the label and the associated magnifier layer are completely customizable in terms of size, shape, graphics, and options for the lens to be peeled and re-adhered to the package surface for repeated use. The IC magnifier label can be designed as either the primary product label, or alternatively it can be a transparent label that can be applied over the primary product label. The latter example allows companies to utilize the technology without the need to make any design changes to the existing product label and it can also be applied directly over text and graphics on other types of direct printed packaging such as cartons. 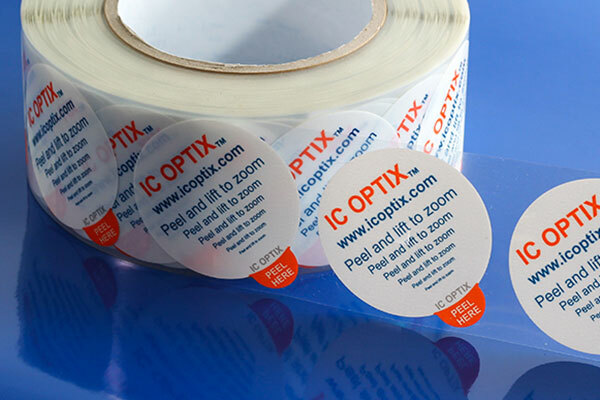 IC Optix will work with your team to define label specifications such as lens size, label size, shape, graphics, adhesive, reel and core sizes, and wind direction. Initially, pilot trials are conducted to produce customized IC magnifier label samples for evaluation and internal demonstration purposes. The process and timeframes for conducting trial work and moving into commercial implementation is no different than for adopting any new label design. IC Optix has strategic relationships through which we can conduct pilot and commercial label production at whatever scale is required. Examples are shown below of the IC magnifier label as a primary label with text and graphics and also as a transparent secondary label that can be used to over-label text and graphics on existing labels and cartons.